This text describes the layout and main functions of the front & rear panel of our nEar04 active desktop monitor. 2. vent port -nEar04 is a vented box speaker system with a vent port on the rear panel. Make sure you are not blocking the vent port (i.e. by putting the speaker too close to a wall) or the sound colour will be changed. 3. speaker wire connection - use these connectors to connect the included speaker wire with the second passive nEar04 speaker. 4. power switch - when you push the power switch, nEar04 will be turned on, and -surprise- it will be turned off when you push the power switch again. 5. power port with ext. fuse - use this connector to plug in the detachable 3-circuit line cord that connects to the power outlet. 6. AC selection - you can select either 110V or 230V AC power according to your local requirements. Make sure this is selected properly before you switch on nEar04 for the first time or your equipment could be damaged. volume control knob - use the volume control to set the proper output level of nEar04. Please be careful and never set the volume too high as it could damage your equipment otherwise. power indicator - the LED on the front shows if nEar04 is switched on or not. 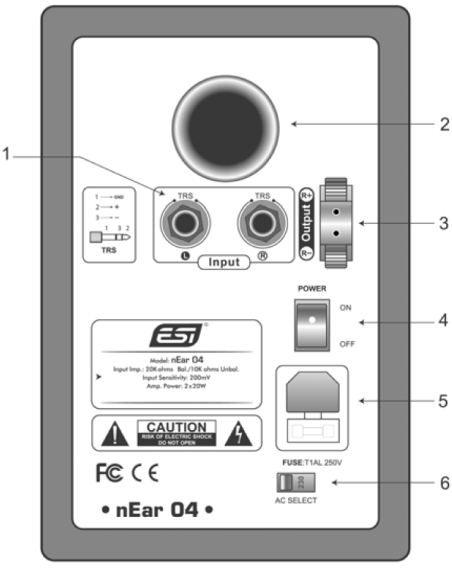 Notice: The above picture shows the front panel of the left speaker. 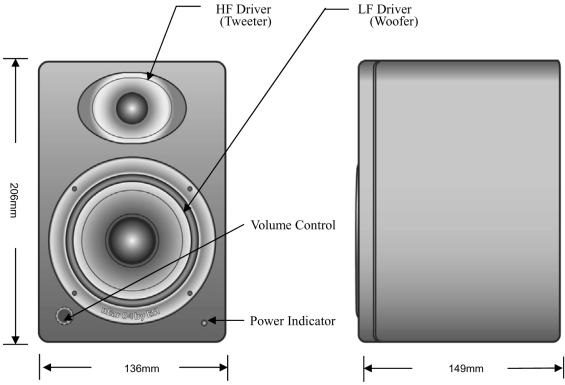 The right speaker does not have a volume control know and power indicator LED.